DAY 01: Kathmandu, Arrive in international airport and pick up and transport to your hotel. DAY 04: After your break fast transport to Domestic airport and flight to Nepalgunj one hour and check in your Hotel in Nepalgunj. DAY 05: Flying one hour to Simikot and Camp at Dharapari 4 ½ hours walk,( 2295m.) this is a short day Hopefully, your flight has arrived in simikot in the early morning and you are ready for a half day of trekking. Start climbing from the simikot airstrip at 2960 metres pass wheat and barley fields on a rocky trail bordered with cannabis and nettles. 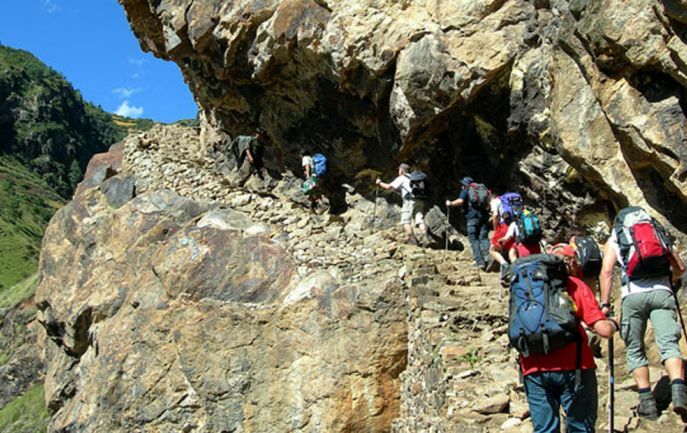 Trek pass the stone house of upper simikot and the community water supply. It does not look far, but it’s a long 300 – metre pull to the top of a forested ridge overlooking the town. The trek then makes a long , steep descent on a rocky switchbacking path passing above the rooftops of Dandaphoya, the village on the opposite side of the river is shara. Continue pass a single house, then on to tuling, also known as Majgaon, a compact thakuri village at 2270 meters. There is a small campsite about a half hour beyond the village. At these lower elevations among unsanitary villages flies are a real nuisance. DAY 06: Dharapari-to-Kermi 5 ½ hours walk (2690 metres )The trail is reasonably level, and walnut and apricot trees provide welcome shade, as the trek passes through Dharapani. The two parts of this scatterd village are separated by the yakba khola. It’s a long . rough traverse across a scree slop to a stream Below the trail a bridge over the Humla karnali leads to khanglagaon, a thakuri village on the opposite side of the river. This is the last Thakuri village in the valley an the upper limit of rice cultivation. Stay on the north side of the river as the trail snakes up and down to chachera, a shepherds camp near a waterfall at 2350 metres, climb over a ridge past swarms of lizards sunning themselves as you approach kermi, situated beside a stream at 2690 metres. The route by passes kermi village itself, the only camp nearby is below the left side of the trail about 10 minutes beyond the village. There is a hot spring about an hours climb above kermi. DAY 07: Kermi –to- Yangre kharka 5 hours walk,( 2850 metres)Climb over a ridge into a big valley with walled potato and buckwheat fields, then climb through a sparse pine forest to a rock cairn on a ridge at 2990 metres. Make switchbacks down to an extensive growth of wild marijuana and nettles on the bank of the chumsa khola cross the stream on a huge log, climb a steep rocky ridge and drop back towards the fast – flowing light grey waters of the Humla karnali. Climb over another ridge, then descend to Yalbang Chaur, a meadow where goat herders camp beside the river at 2760 metres. In November an annual trade fair,or meal at this site. Above this sandy meadow the humla karnali valley narrows and the sides become quite steep. climb over two mores. The trail follows an irrigation canal to a huge rock just to the north of the village. 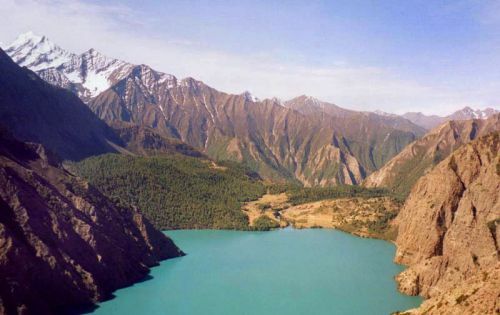 Yalbang shares a hydroelectric power supply with its neigh bour yangar, a few km away. Take the lower, left – hand fork and contour up and around to a house and horse pasture on the ridge below, you can see a bride over the humla karnali and a fidiculously steep trail on the opposite side the leads to puija ( Poyun) the village where yalbang people live during the summer. 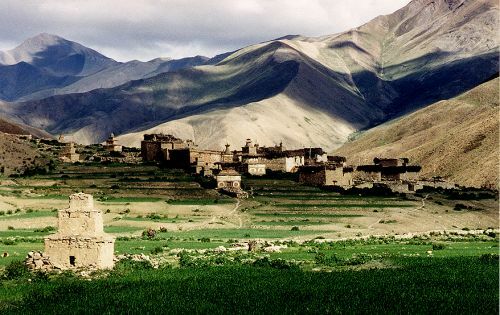 This is also a trade route to the once importandt Humla trading center of chala and on to Bajura south of Humla climb over another ridge at 2930 metres and descend gradually to the extensive fields surrounding the compact village of yangar at 2850 metres. DAY 08: YANGAR -TO- MUCHU 5 HOURS WALK, (2920m.) 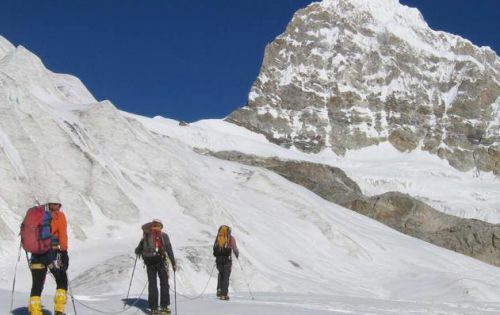 An old route followed a steep trail over a 3500-metre-high ridge, the Illing La, beyond Yangar. Fortunately you can now follow a new, lower path that avoids the climb. 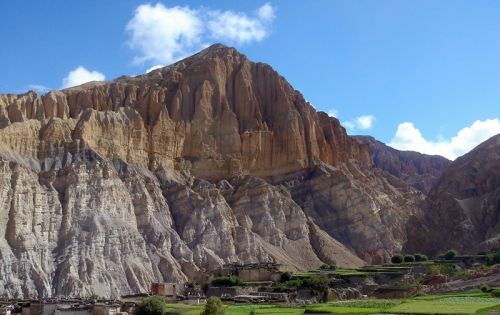 The trail passes through the compact settlement of Yangar, in some places in tunnels beneath houses, then climbs behind a rock spur to a fast-flowing stream. Decline the old trail and follow the new route across a scree slope and out to the end of the ridge before dropping to the river at 2770 meters. The trail wends it’s way precariously close to the river on a track built up with rocks and wooden props and a few stretches where the path was blasted out of the cliff. After more than an hour of ups and downs you will reach a new suspension bridge at 2800 meters. Cross to the south bank of the Humla Karnali and a big rocky Camp beside the river. Climb to a stream, rock-hop across it and ascend past apricot orchards to a totally defunct kani that marks the entrance to Muchu village at 2920 meters. 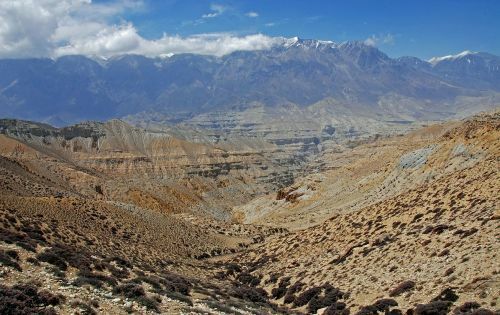 DAY 09: MUCHU –TO- YARI 6 HOURS WALK, ( 3640m)The trail passes below the gompa and stone houses of Muchu. Climb through the orchards and fields of the village to a ridge, then drop into a ravine and climb to a chorten on the opposite side. There are a few house, just behind it is the ridge near the chorten offers a good view of the upper part of the valley and of Tumkot village also known as Mota gompa and it’s large white gompa on the next ridge enjoy the next easy strech of trail as it contours down to the Tumkot Khola, follows the rocky stream bed for a short distance then cross it on a Long bridge. Don’t climb the hills towards Tumkot follow the trail around the foot of the Ridge and cross the Bomchiya khola on a wooden bridge at 2900m the Humla Karnali disappears into a steep cleft to the north behind a high ridge that provides you with the oppetinuty tyo climb up hill for the next two days, the first part of the climb from the Bomchiya Khola is quite steep about half an hour up there is one ocvious trail Junction take the lower left hand trail the upper trail which eventually rejoin the lower trail is a short cut for gots the route enters a steep rock, field gully it’s a long slow sloge upto a ridge at 3270m the path level out as it ascents to a cairn at 3310m, Out as it ascents to a kind at 3310m then descents gently through Juniper trees and climbs again to Palbang, we will get on bright yellow mustard (tori) fields. From toria the trail ascents to stream and deep in got dropping then contours upto a small cairn at 3660m where rounding a ridge you can see the extensive field of Yari the trek follows on irrigation cannel into the Huge valley of the Jyakthang chu market by a many wall at 3640 meters climbs gently to Yari. A compact settlement of stone house. DAY 10: YARI TO HILSHA The trail makes steep continue ascents along the side of the ridge above Sipsip to huge rock cairn atop the Nara lamgma at 4580m. A short distance below the pass you will roind a ridge for the view of Tbetan patue the Humla karnali and the green barley fields of Shera. This hill without a few slips and slides. The trail contours around a large canyon before making a final steep, dusty drop to the Humla Karnali at 3720 m. It is a walk of only a few minutes along the river to Hilsa. DAY 16: Half day trek to Darchen and drive to Lake Manasorovar. Camp.